I know when most people hear the phrase “vegetarian restaurant” fears of eating rabbit food arise. Not only is this a false statement, but there is at least one vegetarian restaurant that is sure to satisfy the biggest appetite. The Grit on Prince Avenue has been an Athens staple for more than 20 years, serving a huge array of homemade dishes for lunch, dinner, and weekend brunch. As a senior, I knew I had to try it out before I graduated so I grabbed my friend Julie and we embarked on this adventure. We were amazed that the lunch and dinner menu had so many choices that it was hard for us to choose! If you’re ready to delve into a serious vegetarian meal, try the Falafel Platter or the Teriyaki Tofu Wrap. If you’d rather stick to something you’re more accustomed to, get the Buffalo Chick’n Sandwich, Big Daddy Burger, or Loaded Nachos. 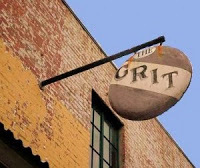 (In case you haven’t noticed, The Grit has food from all over the world!) I tried the Grilled Cheese Smelt and the Stir Fry and they were both deliciously filling (and very reasonably priced as well!) There’s more space inside than I expected and the restaurant has a good, eclectic vibe fitting of Athens, GA. It’s easy to see why this seemingly niche restaurant has thrived for so long; they serve delectable food in a fun environment for great prices! Don’t be scared to try The Grit next time you go out! Check out a bigger list of Athens, Georgia restaurants here.